The Bay of Plenty region has 10 major awa (rivers) and hundreds of other rivers and streams that sustain our work, life and play. More than 211,468 litres of water per second flows through Bay of Plenty's main rivers, streams and aquifers. Council regularly collects water quality and quantity information from 680 water monitoring sites across the region. Read about the river and drainage schemes now. Our rivers include Wairoa, Kaituna, Tarawera, Rangitāiki, Whakatāne, Waioeka, Mōtū, Raukōkore, Otara and Whangaparaoa. The region’s longest river is the 155 kilometre long Rangitāiki River. Some of the mature female tuna (eels) that live in the Rangitāiki River were born more than 60 years ago. The Kaituna River is 50 kilometres long and runs from Lake Rotoiti to the Maketū Estuary. At seven metres tall, Tutea Falls on the upper Kaituna River is the world’s highest commercially rafted waterfall. The Wairoa River is approximately 14 kilometres long and it's the largest freshwater tributary into the Tauranga Harbour. Four power stations harness energy from the Wairoa River to generate hydro-electricity. The Whakatāne River catchment covers more than 1,100 km2 and extends 112 km to its upper tributaries. The Tarawera River is thought to be fed by at least six lakes: Rotokakahi (Green Lake), Lake Ōkāreka, Lake Tikitapu (Blue Lake), Lake Ōkataina and Lake Rotomahana all flow into Lake Tarawera and into the Tarawera River via streams and springs. Prevent and report pollution at work, home and play. Stop the spread of freshwater pests by cleaning water sports gear between waterways. Get involved in public consultation on council plan changes and budget decisions. Find out more about Kaituna River, Rangitāiki River and Wairoa River. The Kaituna Catchment Control Scheme includes the catchments of Lakes Rotorua and Rotoiti as well as the catchment of the Kaituna River. 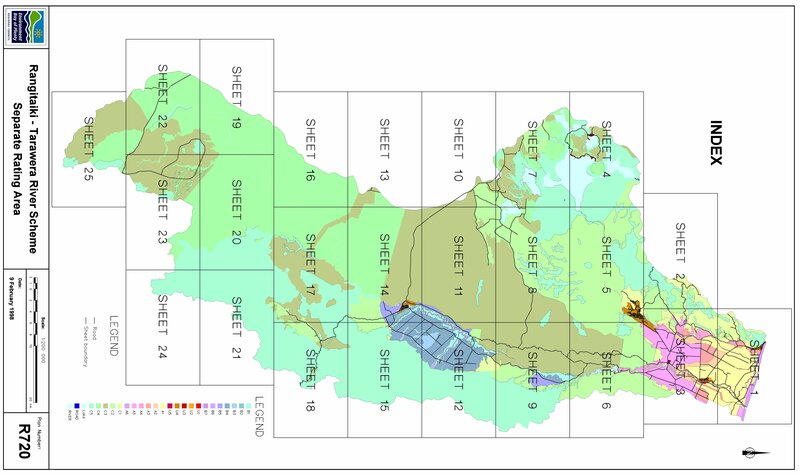 The whole catchment area covers 1,250 square kilometres (125,000 ha). Membership of the Rivers Scheme Advisory Groups is representative of the different interests and locations within the scheme areas. The groups are designed to share knowledge and views on scheme management matters on behalf of local scheme ratepayers. The groups’ advice on community values, objectives and possible solutions will help us make the best decisions for our river scheme projects, capital works, maintenance programmes and flood repairs. More information on membership and the role of the advisory group can be found in the Terms of Reference. Advisory group meetings are held twice a year, usually in March and September, and are chaired by elected Bay of Plenty Regional Councillors. The Kaituna Catchment Control Scheme meetings are chaired by Councillor Bill Clark with Councillor Norm Brunning as deputy chair. Note: Meeting date or venue may change. The Kaituna River starts at the outlet of Lake Rotoiti at Okere Arm and enters the sea at Te Tumu near Maketu. It passes through a steep, narrow gorge, well known for its white water rafting, before meandering through the alluvial terraces of the mid Kaituna River and the peat and sand deposits of the lower Kaituna basin. Lakes Rotorua and Rotoiti contribute a large proportion of the everyday flows. The Mangorewa River is a majority tributary, which contributes greatly to flood flows in the Kaituna River. Other significant tributaries include the Waiari, Ohineangaanga, Raparapahoe and Kopuaroa Streams, which drain the hill country behind Te Puke. 10 kilometres of stopbank through the Rotorua urban area. Significant areas of soil conservation works where most streams have been fenced and planted with native or exotic vegetation or allowed to regenerate. Flood protection stopbanks on Waingaehe, Puarenga, Utuhina and Waiowhero Streams through the Rotorua urban area. Stream clearing, straightening and construction of floodways on Ngongotaha and Waiteti Streams to minimise flooding. Level control structures on Lakes Rotorua (Ōhau Channel Weir) and Rotoiti (Ōkere Control Gates). 99 kilometres of canals and drains. Seven pump stations (and 14 pumps). Riverbank protection - six kilometres of planting and 1.5 kilometres of rock or rubble. Mole/groyne structure at the river mouth. The Rangitāiki Drainage Scheme provides benefits of gravity drainage to much of the land on the Rangitāiki Plains. The Rangitāiki Plains covers an area of 29,000 ha between Matatā and Whakatāne, extending from the coast to Kawerau and covers the lower flood plains of the Rangitāiki, Tarawera and Whakatāne Rivers. The predominant land use is dairying, horticulture and grain cropping. There are also small areas of wetland reserve and urban development. Prior to European settlement in 1890 the Rangitāiki Plains consisted mostly of wetlands. The total value of the scheme is approximately $4.4 million (scheduled for review). The costs of capital works and scheme maintenance is solely provided by the scheme ratepayers. 328 kilometres of major canals and drains servicing 29,000 hectares. Culvert and flapgate structures at 22 locations. 1100 metres of low stopbanks. This does not include assets of the Rangitāiki-Tarawera or Whakatāne-Tauranga Rivers Schemes or the 34 separate communal pumping schemes, which also service the Rangitāiki Plains. Significant issues facing the scheme are subsidence, conservation values and weed control. 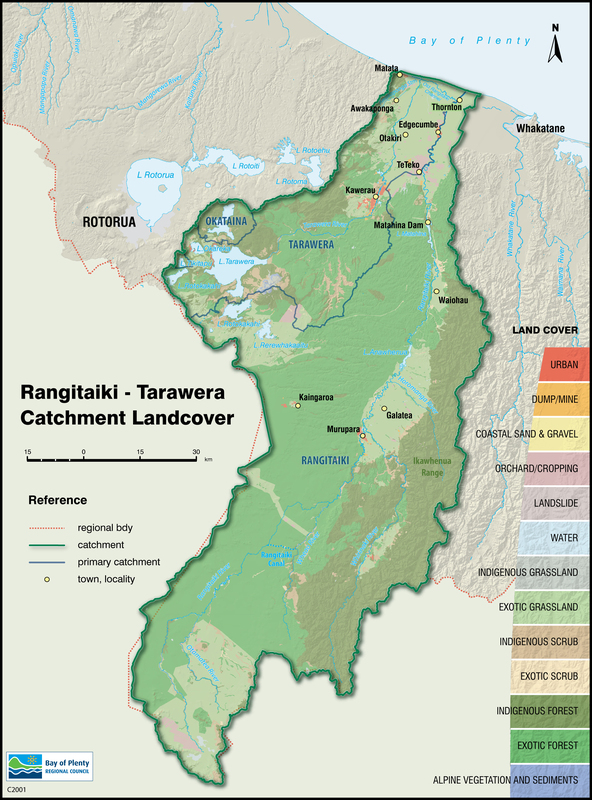 The Rangitāiki-Tarawera Rivers Scheme comprises two river catchments - the 3005 km2 Rangitāiki catchment and the 984 km2 Tarawera catchment. Advisory group meetings are held twice a year, usually in March and September, and are chaired by elected Bay of Plenty Regional Councillors. The Rangitāiki-Tarawera Rivers Scheme meetings are chaired by Councillor Norm Brunning with Councillor Bill Clark as deputy chair. The Rangitāiki River rises 130 kilometres from the Bay of Plenty coast and 32 kilometres east of Lake Taupō to an elevation of 800 metres. It flows 64 kilometres across the Kaingaroa Plains to Murupara where the flood flows are only two or three times the normal as a result of the absorbent pumice plains. 20 kilometres further on the Whirinaki and Horomanga tributaries join the main channel contributing relatively large flood flows and quantities of shingle. The river flows across the Galatea Plains before entering the hydrolake Lake Aniwhenua. Lake Rerewhakaaitu drains into the river which then passes through a gorge and out on to the Waiohau Plains to the hydrolake Lake Matahina. Finally the Rangitaiki passes through a valley, across the Rangitaiki Plains and out to sea at Thornton through a 1500 metres cut excavated in 1913. The Tarawera River drains from Lake Tarawera at 300 metre elevation. The river drops to 150 metres in 6.5 kilometres and continues to fall to Kawerau. Below Kawerau the grade is more gentle. Tributaries such as the Mangawhio, Waiwhakapa, and Mangate join the Tarawera River above Kawerau, the Mangaone and Ruruanga near Otakiri and Awakaponga near Matatā. 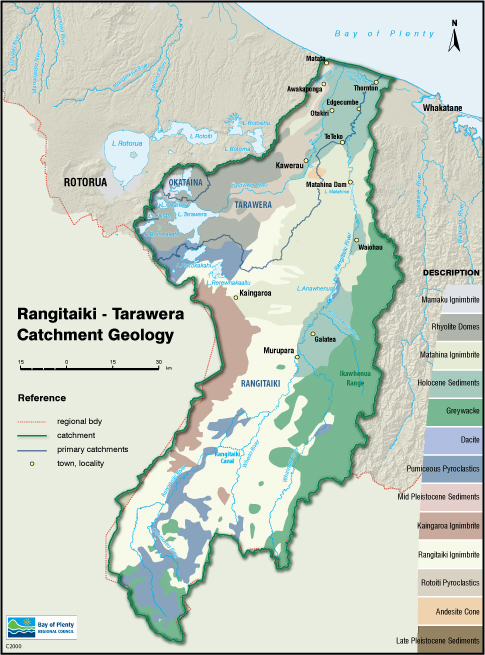 The Rangitaiki Plains drainage scheme also contribute to the Tarawera flow. The pumice of the Tarawera catchment and ponding effect of the lake regulate the runoff and maximum recorded floods have only been two to three times the normal flow. The Whakatane-Tauranga Rivers Scheme comprises two main catchments - the 77km Tauranga (formerly Waimana) River with a 440 km2 catchment and the 112 km Whakatane River with a 1100 km2 catchment. Both catchments are relatively narrow and the tributaries short, steep, and bush covered. The underlying rock foundation over the whole of the area is greywacke. The Scheme includes substantial stop banking of the main river and some major tributaries, floodgates, gravity and pumped drainage outlets, and considerable channel edge (bank) protection and plantings. The scheme includes the Whakatane and Tauranga Rivers and the Te Rahu, Waioho and Wairere tributaries. Advisory group meetings are held twice a year, usually in March and September, and are chaired by elected Bay of Plenty Regional Councillors. The Whakatane-Tauranga Rivers Scheme meetings are chaired by Councillor Norm Brunning with Councillor Bill Clark as deputy chair. The Tauranga River is 77km long with a catchment area of 440 km2. The Tauranga River valley floor is narrow and has few areas of river flats in the upper 48km, but after leaving the main range the floor widens and for the next 19.5 km the river channel is wide and braided. The final 13km of the Tauranga River are through a gorge with the exception of the last 1.6km where it empties on to the valley floor just upstream of the confluence with the Whakatane River. The Whakatane River is 112km long with a catchment area of 1100 km2. The Whakatane River rises in the Huiarau Range and quickly drops into a deeply incised valley and there are no significant river flats for the next 64 km until the river flows out of the main range at the upper Ruatoki Valley. At this point the valley floor widens out to an average width of 11600 metres before widening out again at the limeworks. Below this for the next 6.5 km the river has developed a wide meander belt with considerable areas of shingle bed and marginal river flats. Below the Ruatoki Bridge which is 26.6 km upstream of the sea, the river is generally more confined due to the establishment of willow edge protection until it reaches the confluence with the Waimana. From there it continues for another 3.5 km before it reaches the Pekatahi Bridge and below this the river is stop banked. The Whakatane River Scheme is a river and drainage scheme that includes: substantial stop banking of the main river and some major tributaries, floodgates, gravity and pumped drainage outlets, and considerable channel edge (bank) protection and plantings. The scheme includes the Whakatane and Waimana Rivers and the Te Rahu, Waioho and Wairere Tributaries. The aim of the original scheme was to provide 100 year flood protection along the lower 12.8 km of the river, partial flood protection and channel improvements along the upper 30.4 km of the Whakatane River and 28.8 km of the Waimana River, and improved drainage for approximately 4000-6000 hectares of the Eastern Rangitaiki Plains. Previous to the scheme extensive flooding was a common event for the low lying areas generally north of the Awakeri-Taneatua railway line, from western drain in the west to Waioho Stream and up the Whakatane River valley. Whakatane Borough was subject to flooding on the western side, and indeed was unable to be developed for housing until after the construction of the nearby stopbanks and channel control works. Scheme construction commenced in 1965 and was completed in 1981. A scheme review of the lower Whakatane River protection works was undertaken in 1985 following the availability of further hydrologic and hydraulic data. This resulted in some further works which were completed in 1993. An analysis of flow records for the period 1957-94 shows that the one in one hundred year flood for Whakatane River as measured at the Valley Road recorded, is 2460 cumecs (cubic metres per second). The mean flow of the fiver for 1957-95, at Valley Road, is 57 cumecs. (Surman 1995). Subsequently the council adopted a three year programme of works which began in 1994/95. That programme includes clearing, training groynes, layering, trenched willows, planting and fencing to return the rivers to a stable meander pattern in terms of width and alignment. Once the plantings and protection works are established, the reaches will be established, reducing repair works currently necessary after most floods. Maintenance of the scheme is funded by way of a rate struck over the area of benefit. A "classification" (Circa 1969) establishes the relative benefits received by all the lands within the scheme. Bay of Plenty Regional Council reviewed the classification during 1993 and found it remained fair and equitable. Rates for any property are calculated on the basis of land value and benefit classification of that property. The areas receiving benefits from the scheme amounts to approximately 19,400 hectares and as at 31 January 1996 this area had a land value of about $550 million, and a capital value of about $1,233 million. 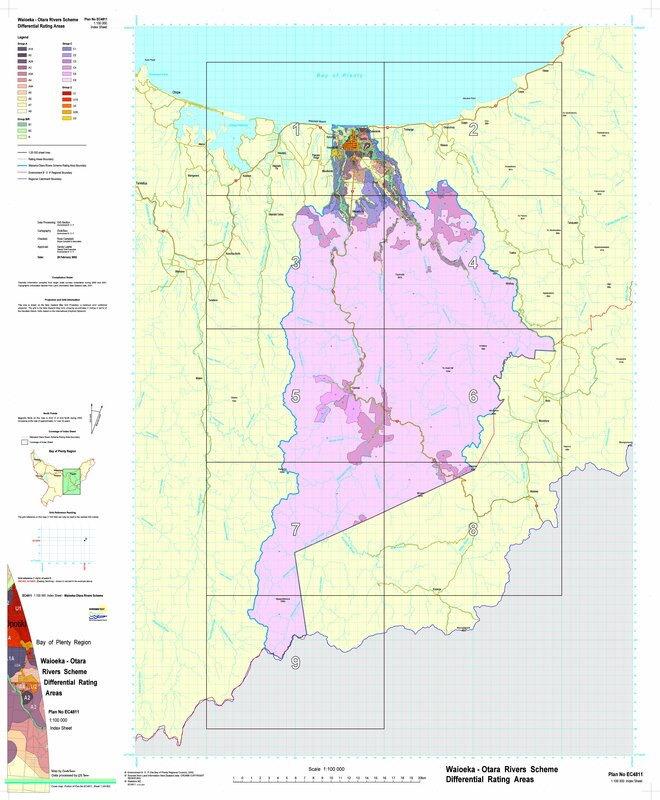 Whakatane-Tauranga Rivers Scheme Rating Area Map - index sheet. The Waioeka-Otara Rivers Scheme comprises two main catchments - the 60km Waioeka River with a 825 km2 catchment and the 30km Otara River with a 350 km2 catchment. The lower reaches of both rivers meander across flood plains before joining at Opotiki and flowing out to sea. Intensive rainstorms occur in both catchments with associated flooding and gravel movement being difficult to control. The Scheme includes substantial stopbanking of both the town and rural sections of both rivers, one pump station (Duke Street) and considerable bank edge protection works including riprap, rubble and plantings. The scheme also includes flood protection to the land adjoining Mill Stream and minor drainage works. Advisory group meetings are held twice a year, usually in March and September, and are chaired by elected Bay of Plenty Regional Councillors. The Waioeka-Otara Rivers Scheme meetings are chaired by Councillor Norm Brunning with Councillor Bill Clark as deputy chair. Waioeka-Otara Rivers Scheme Rating Area map - index sheet. For minor rivers and drainage maps please contact info@boprc.govt.nz.